Sheet music with scales and classical piano pieces, directly visible on the web page or to download as .PDF-files. Besides learning scales from visual diagram presentation, it is a very good idea to exercise them in notated form. When you are done with your scale exercises, you can try to play some piano pieces from classical composers. One-octave scale sheets descending and ascending. Double sharps are used in some scales (the note is raised by two half-steps, or a whole note). 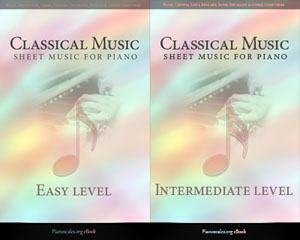 Sheet music for piano and keyboard. As a member and supporter of Pianoscales.org you will among other things receive the Classical Music Easy Level eBook with sheet music. Each of these are well-recognizable piano pieces and presented by special made arrangement to match the level of beginners. The book includes composer biographies and tips for playing the piano pieces.